Ever get the feeling that your printer is on the brink of biting the big one? Well, that's what happened here when our old HP inkjet started printing out smudges. So we chucked that model out and got a newer printer from the fine folks at Samsung. 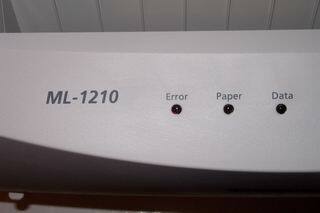 Instead of going the regular inkjet route, we received a nice small laser printer, the ML-1210. If you ever had the opportunity to use a laser printer at your local office or school, you'll pretty much want one in your house. The speed and clarity of the print can't be compared by most inkjet printers. 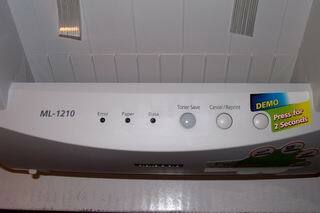 What our ML-1210 immediate difference from most laser printers is the size. This unit measures in at 329 x 352 x 229 mm and weighs only about 13.6 pounds. The unit is small enough to fit in most homes and smaller offices without a problem. Also note the price tag, which is around $200.00! That's definitely the most affordable laser printer I've come across lately. 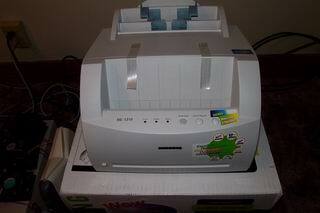 Size (WxDxH) 13" x 13.9" x 9"
You get the unit itself, a large directions sheet, drivers and 2 toner cartridges. This is a great value as the toners themselves cost a pretty penny. One downside is that you will need to get your own parallel cable or USB cable, it isn't included in the package. The unit feeds paper from a top loading tray. The blue tabs extend to allow the maximum width of 8.5" to fit. Most documents you print will not exceed this measurement. 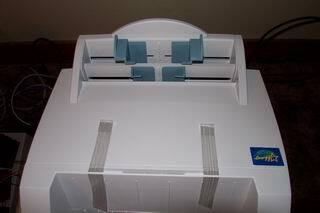 Right underneath the top most tray is another smaller tray, which is used to load envelopes and other papers. I didn't remove the tape holding back the front opening, but we'll get to that later. The front panel is where the LEDs and buttons are located. It is not complicated to use the printer as everything is pretty straight forward. There are three LEDs on the left that lets you know if there's an error while a print job is in progress, whether there's a paper jam and finally the data light shines when its printing. 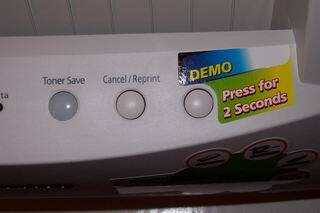 The buttons next to it let you choose the Toner Save feature and to cancel/reprint a job. There's also the demo button, which I'm sure your not going to use much. One of the best features is the Toner Save option. It lets you cut down on toner usage, which is probably a good thing if you're using this mostly for printing text documents. It can save, in a year, 30% toner and print an extra thousand sheets worth. So you're talking 3500 prints! In a text document, I could barely tell the difference when Toner Save was on. Another feature that's quite useful is the N-Up printing ability. 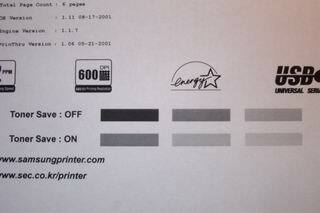 This lets you print up to 16 pages on a single sheet. Good to use if you've got multiple sheets and really would just like to quick reference them on piece of paper.